This is True’s Podcast, Uncommon Sense, first debuted 7 July 2017 — with the first issue of the publication’s 24th year. In September 2018, it relaunched with a new focus; episodes from the first series are no longer available. A new episode comes out most every week. To See a List of Available Episodes, scroll down or click here. You Can Also subscribe to email notifications in the sidebar (see the form labeled “Blog Post Notifications” on any episode page) which will send you an automated email notification of all new blog posts, including podcasts. Too complicated? You can also listen by going to each episode’s “Show Page” and clicking on the Play button at the very top. Podcasts are how I listen to my favorite radio show, NPR’s Science Friday, as well as several other high-quality shows with information I want or need. With iTunes on an iPhone or iPad tablet, you can subscribe to any of thousands of different titles that automatically download to your phone. You can listen to the shows at your convenience, and that way you can hear shows you really want to hear, rather than what happens to be on the radio when you are on the road needing something to listen to. I don’t like brain-rot shows that are interrupted every three minutes by strings of even more brain-damaging commercials; I want to listen to what I really want that makes me smarter, or is at least intelligent entertainment. Not an iPhone/iPad Person? Actually, I’m not either: I use an Android phone myself; there are plenty of podcast apps you can get free that will download, manage, and play the shows you subscribe to. I now use Podcast Addict since it’s highly configurable and flexible, but not terribly complex to figure out how it works. Like many such apps, it can be set to only download shows when connected to WiFi (to not use up your mobile data plan). The True podcast is a “live to tape” show (read: very light touch on the editing, like removing technical snafus). It will decidedly not be a recording of me reading stories: I’ll usually have a co-host, and we’ll talk about the stories, interview guests, talk about the “story behind the stories,” and, yes, from time to time you’ll be able to hear some of my “rants” about various issues, in my voice, coming to you for 20-30ish minutes each week, on Fridays. In other words, it’s completely separate from the newsletter, not an audio version of the newsletter. It’s also free, with sponsor and/or reader support. It would be great if, in addition to podcast and web listening, it was also possible to download episodes as plain MP3 files. To some of us, a good ol’ MP3 player is much easier to use than a smartphone. 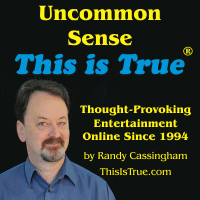 At least two other “uncommon sense” podcasts already exist.